On November 1, 1943, fighter squadron VF-14 was commencing a carrier breakup over the Quonset Point Naval Air Station. Two flights were in the air at the time; one flight of six planes, and a second flight of four. 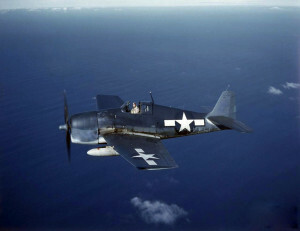 All aircraft were F6F-3 Hellcats. As the flight of four planes crossed over the flight of six, the last two planes in each group collided in mid-air. On aircraft, (#66024), was piloted by Ensign Prentice A. Martin, age 23. The other aircraft, (#65923), was piloted by Ensign George E. Kloss, age 23. Both planes fell into 26 feet of water not far from the shore of the naval air station. Neither pilot survived. Ensign Kloss is buried in Holy Sepulchire Cemetery in Alsip, Illinois. Ensign Martin is buried in Memorial Park Cemetery in Oklahoma City, Oklahoma.